To restage an exhibition from 1969 in 2013 with as much fidelity as possible both to the original selection of works displayed and the original disposition and layout requires managing a series of transpositions. The result is a festival of anachronisms. It occurred to me that one could make a typology of the kinds of transfer on display. Here is what I came up with. Absence. Some works in the 1969 no longer exist and could not be remade (either for legal or practical reasons). These were shown as absent, with dotted white lines marking the place on the floor that they inhabited in the original show. Not one person I heave heard talk about this reinstallation has failed to note sardonically that the effect was like that of the outline of dead bodies at a crime scene. One work in the exhibition passed from the present to the absent state during the course of the exhibition. Walter de Maria’s telephone piece, mentioned in the previous post, required the existence of the artist, who at any moment might call the phone located inside the exhibition. Sadly, the artist died in July, and at that point the organizers decided that the piece had to go, since it does not consist merely in the presence of the telephone and the text announcing what it is doing there; it requires the potential real presence of the artist on the line. Thus, the telephone and text were removed, and the dotted white lines appeared. 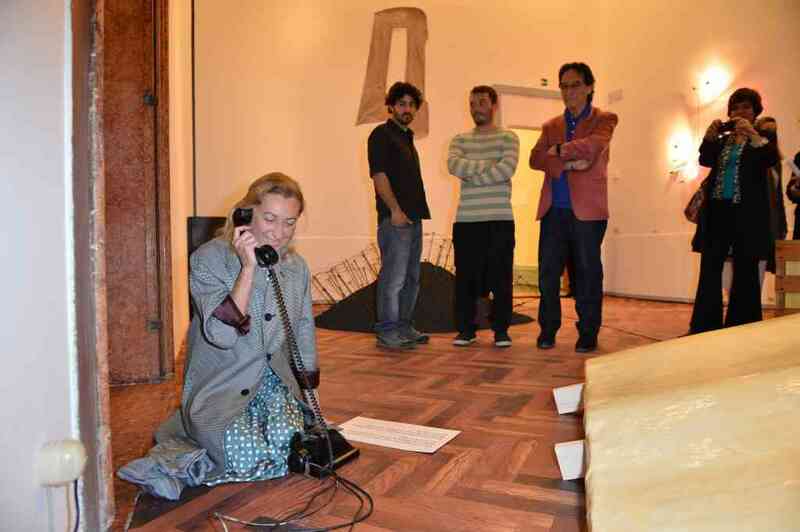 Miuccia Prada was the first to answer the phone and talk to Walter de Maria live at the 2013 exhibition’s opening. Substitution. Sostituzione was the term adopted by the curator of the 2013 reinstall, Germano Celant, who himself had a role in picking the Italian artists represented in the 1969 exhibition. (Which means that he was himself only partly a sostituzione.) Their English translation was “replacement,” but I think substitution is just fine as a translation. This is a substitute for the original missing work, using the same material as the original work, to the same scale, in the same shape. My understanding was that the artist has to be alive to oversee the making of a substitution. One wall of the original exhibition carried (or should I say buttressed) three of Richard Serra’s prop pieces. In the 2013 reinstall, the two flanking works were substitutions and the central one was original. Interestingly, the substitutions had much more rust and surface irregularity than the original work, which was quite smooth and clean. It seemed to me as if the substitutions were protesting a little too much, like millennial punks with too many piercings. Exhibition copy. This is now a widely accepted category of substitution, designed to meet the increasing demands for works to be shown in exhibitions. Alan Ruppersberg’s “Untitled Travel Piece, Part 1,” consisted of a partially overlapping stack of four newspapers: The Omaha World Herald of December 17, 1968; The Chicago Tribune of December 18, 1968; The Cleveland Plain Dealer of December 19, 1968; The Salt Lake City Desert News of December 19, 1968. The exhibition copy offers a stack of correctly sized paper, with a printout (essentially a photocopy) on the first page of each newspaper. The other pages were blank. It was disappointing. The currency of the original piece (which by now is sitting somewhere, sorely yellow) was lost. Relic. This is the original work, presented again. This seems simple enough, but sometimes the original work no longer resembles itself. For example, Richard Tuttle’s “Canvas Dark Blue” of 1967 is now pale violet, and his “Pale Purple Canvas” of the same year is light grey. Since these are works made with minimal artistic intervention, they could have been remade using fresh textiles. Substitutions would have been closer to the originals than the originals themselves. Finally, there was the housing of the show itself, recreated in a Venetian palazzo, but maintaining as far as possible the original proportions, sequence, and look of the rooms in Bern. This was the work of the artist Thomas Demand, master of recreated environments. The original wall colors and baseboards were copied as to color, but not in the original materials. 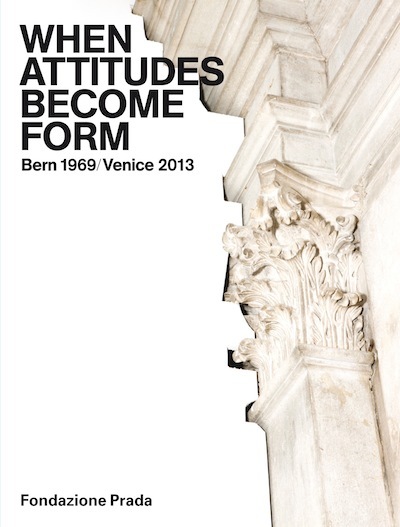 The floors at Bern were notably various, and at Venice we strode on linoleum (or something a lot like linoleum) printed with one to one photographic images taken from the original Bern floors. To the greatest degree, the meeting of the floor patterns with the disposed works of art was followed in Venice. In typical Demand fashion, no bones were made about the artifice involved, which was sufficient to produce the effect of transport without being overly niggly in the details. The places were the recreation ended and ceded space back to the palazzo–drywall cut to fit around the profile of a pilaster and entablature–were highly legible device-baring moments. Very nice, Alex. One question I’ve been thinking about lately: do these and other concepts that have a long history from the middle ages (or antiquity) to the present serve only as a unifying frame by which we might re-view the art of otherwise disparate histories, or do they reveal significant continuities underlying an anthropology of art (ala Belting and others?) What do we gain by thinking in terms of substitution rather than mimesis/representation/presentation? Is s. a more capacious concept that brings image/art/place into relation with other, perhaps overlooked, categories? There are so many questions here I am not sure where to begin. So I think the best place to begin is to ask you, since you seem to have opinions, what do you think?